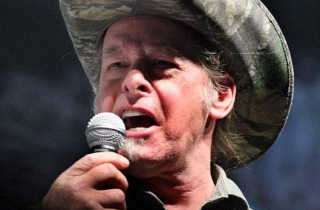 Ted Nugent has apologized for his “sub-human mongrel” remark aimed at President Obama, though he wouldn’t direct the apology at the president. After a week-long CNN crusade and Sen. Rand Paul (R-KY) calling for an apology, Nugent finally did so Friday morning while appearing on the Ben Ferguson Show. The rocker branded his words as “street fighter terminology,” and vowed to “elevate his vernacular” to the level of prominent Republican Texans like Gov. Rick Perry, Sen. Ted Cruz, and current gubernatorial candidate Greg Abbott. “I do apologize–not necessarily to the President–but on behalf of much better men than myself,” he said in an interview with conservative radio host Ben Ferguson, who’s also a CNN political commentator.